This weeks post covers a Sternguard Veteran squad. As is the case with all the newer Space Marine kits, these models are top drawer! Just a with the Vanguard Veteran Squad, these were a pleasure to build and paint. Before I completed painting these marines, way back in 2014 I was able to deploy them during a couple of battles at Warhammer World. Delivered in a Drop Pod they were used to harass backfield units. I remember that they performed quite well and hopefully, now painted up, they will continue that trend! I found the robes quite difficult to paint but I think they have tuned out quite well. I'm also not quite sure whether I prefer green eye lenses or red for marines with white helmets. 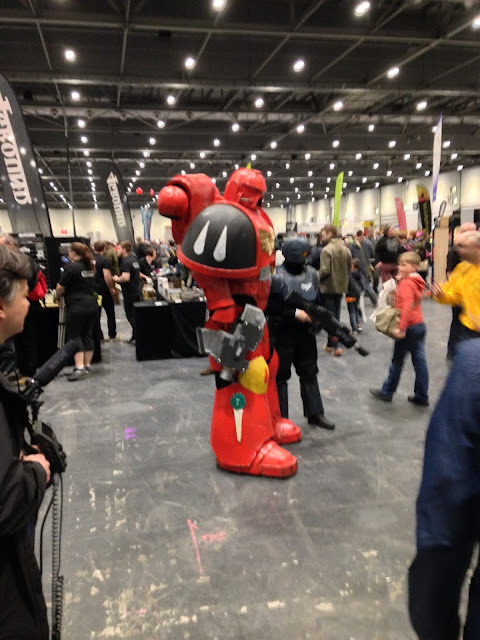 After a few years of missing the event, this year I was determined to attend Salute in London. I'm very happy I did. Its a great day out for any hobbyist no matter your favourite gaming system. As its the year of my wedding, I set myself a strict budget for the day but I still managed to come away with various modelling bits and a couple of bargain! (like a built Blood Angels Death Company squad for £15). To cap of what was a great day at Salute, I was also able to visit Brewdog and Bodeans in Soho for some epic beer and BBQ food! Oh and this was the day I won the painting competition! Being a Lean, Mean Hobbying Machine... And Also an Adult! For most of us (unless your name is Carl Tuttle [from the Independent Characters]!) hobbying, and specifically it's cost, needs to be considered in the context of our adult lives. e.g. if I spend £100 on a boxed game of Warhammer Quest, Betrayal at Calth, Renegade etc. what cool thing will I be unable to do with my partner, or what other more essential 'stuff' will I be unable to purchase. As I've mentioned in a couple of posts, 2016 is the year I get married. Weddings and honeymoons are expensive. Not only is my monthly pot of 'spending 'money' smaller than it has been in the past, it will likely always remain that way as, ultimately, I need to pay my way and would prefer to have the ability to take my Fiancee/future Mrs. Banjo on surprise holidays (or more local adventures to the pub). The challenge which needs to be considered is, I am passionate about Warhammer... which as we know, is a rather expensive hobby... and it is much easier to buy models than dedicate the time required to prep/build/paint them. Taking this (self imposed) limitation into consideration, and bearing in mind just how easy it can be to end up with a load of boxed models which will most likely remain in that state for years, I have recently taken to clearing out a lot of miniatures. The goal is to free up cash to fund my next project, Blood Angels and keep my hobbying back log 'lean'. This BA force, as with all that I undertake moving forward, will be of a smaller scale than my Space Marine army. For example, for Blood Angels I will focus on the fast attack/combat specialisation of that Chapter and will built a 1500 point (fluffy) list consisting of as many specialised Blood Angel miniatures as possible. I will cover my planned list in an upcoming post. Interestingly, to co-incide (or maybe kick-start this clear out) with this action I watched a good video by TableTop Minions titles 'Dont Be A Warming Hoarder' (linked below) and whilst my backlog of models is much smaller than Atom Smasher's (host of the video), I can relate to the point he is raising. I guess the message is; be lean with you hobbying, be agile and don't waste money. This will be my mantra with hobbying from now on. Having written all this, yesterday I was in Warhammer Bath and to be honest, I don't quite understand how I exfilled the store without a copy of Warhammer Quest under my arm. Whilst it has been a while since my last blog post, I have continued to expand my Space Marine army and have added some new completed units to its numbers. To be honest, since Christmas I have known that I will be getting a new camera so have waiting to post any new blog articles. Now I have it, on with the show! One of the units which has waited patiently for its time in the spot light is this Vanguard Veteran Squad. This unit was a pleasure to paint and is, in my opinion anyway, the best standard of painting I have achieved to date. I went with 2 x Thunder hammer/Storm Shield and 2 x Lightning Claw marines to give a bit of balance to the squad. I'm most pleased the Storm Shields and how the Relic blade on the sergeant turned out. The white helmets also turned out very well using (base) Celestra Grey -> (shade) Nuln Oil -> (layer 1) Ulthuan Grey -> (layer 2) White Scar .